With almonds coming out of dormancy, growers are thinking about the measures they can take to ensure a more bountiful harvest this season. Using a three-step approach, Arysta LifeScience recommends that growers start at the foundation and follow with a foliar nutrition application to optimize fruit set, quality and nutrient efficiency. It’s no surprise that most good practices to ensure a strong finish take place at the foundation of the crop: its roots. Roots have a key role in the nutrition and development of the plant. It is not enough to have nutrients available in the soil — the plant also needs the appropriate structures to use them. For a stronger root foundation, Arysta LifeScience recommends PILATUS® nutrient formulation. PILATUS is a globally proven proprietary formulation designed to establish a solid plant foundation by initiating and continuously promoting the root development of your specialty crops. The product’s strong formulation promotes root development, growth and optimal nutrient absorption. The first application should be made through drip irrigation systems beginning at petal fall and then once again 30 days after petal fall. Growers can have peace of mind that their crop is in good hands with PILATUS. 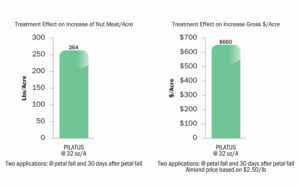 In recent trials, orchards treated with PILATUS had a 264-pound per acre increase in yield over untreated acreage. And with the PILATUS Performance Assurance Program, Arysta LifeScience guarantees a positive yield response in not only tree nuts, but also wine grapes and citrus. If the product is applied as outlined in the rules and conditions for the specialty crops listed, and your yield improvement does not cover the cost of your PILATUS, Arysta LifeScience will replace the PILATUS you purchased. Next, focus on the bloom with BM 86™ and post petal fall to hull split with CINETISTM. 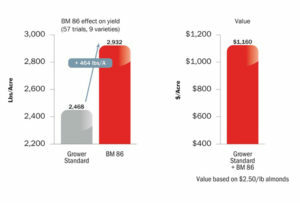 Powered by a unique, proprietary polyborate formulation and proven GOËMAR® Formulation Technology, BM 86™ is a premier bloom time product that is used to optimize fruit set and quality on fruiting vegetables and tree crops. The foliar-applied solution is tank-mixable with multiple products and is ideal for a variety of crops, including tree nuts, tree fruit and vines. Backed by 57 trials, almonds treated with BM 86 had an increase of 464 pounds per acre. CINETISTM is a premier foliar product that works to improve nut size development without decreasing yields. It uses proven GOËMAR® Formulation Technology to optimize nutrient utilization efficiency. In addition to tree nuts, CINETIS is labeled for use on a variety of crops, including grapes and citrus. For convenience, the product is tank-mixable with most fungicides, insecticides and foliar nutrients. Applications can be made after nut set during the growing season, and post-harvest as well. 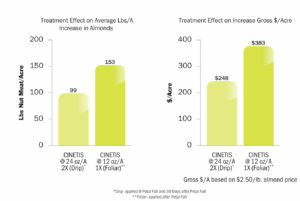 In recent trials, almonds with CINETIS foliar-applied post-petal fall had an increase of 153 pounds per acre of almonds. For enhanced nut size that don’t compromise yields, apply CINETIS from petal fall through hull split. Unlock the genetic potential of your crop to ensure a bountiful harvest this season. For a complete look at PILATUS, BM 86, CINETIS and the Arysta LifeScience portfolio of almond protection products, click here or contact your local Arysta LifeScience sales representative.